Move over Flat Stanley, the Red Chair is the newest travel icon. 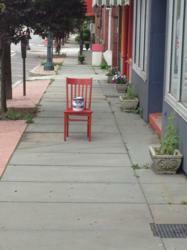 The Red Chair Travels made its way to Hawley, PA in the Pocono Mountains with a can of paint after the town won a national contest to have the Main Street repainted. We plan to show the chair a great time in the Pocono Mountains' Lake Region before delivering it to The Wooden Duck Bed and Breakfast in Newton, NJ as it continues its journey. Where travelers once held photos of Flat Stanley in unusual places, photographers now shoot photos of a humble red chair. Long considered simply a place to rest one’s buttocks, the lowly wooden chair has been elevated to celebrity status, and is being welcomed at inns and B&B throughout America, all part of a consciousness raising experiment among innkeepers. And this week through July 13, the chair is in the Pocono Mountains (PoconoMountains.com) after making its way from the Inn at Lake Joseph, in Forestburgh, NY to Hawley, PA and The Settlers Inn. Together with innkeepers Jeanne and Grant Genzlinger, the Pocono Mountains Visitors Bureau will be touring and shooting images of the Red Chair in the Pocono Mountains, including visits to downtown Hawley, recently named one of the top 20 towns to be repainted by Benjamin Moore as part of #PaintWhatMatters, Main Street Communities Matter. Additional Red Chair sighting will be at Lake Wallenpaupack, Dorflinger Glass Museum, the Appalachian Trail and Bushkill Falls. The Red Chair will also take a seat at the Finger Bowl, the water-based table, at Grey Towers National Historic Site in honor of the 50th Anniversary of President John F. Kennedy dedicating Grey Towers as a public asset for conservation to the U.S Forest Service. Look for more tales of the Red Chair’s local travels on Pinterest at pinterest.com/poconotourism and on Facebook at facebook.com/TheSettlersInn. “We plan to show the chair a great time in the Pocono Mountains' Lake Region before delivering it to The Wooden Duck Bed and Breakfast in Newton, NJ as it continues its journey,” says Genzlinger. Follow along as the Red Chair visits the Pocono Mountains, #RedChairTravels, @RedChairTravels, #PoconoMtns and #LakeRegion. Throughout 2012 and early 2013, the Red Chair developed a personality of its own being photographed by innkeepers in communities from one end of New England to the other. Starting in Cape Cod, the Red Chair journeyed throughout the six New England states on a nine month tour. Follow the Red Chair’s travels on RedChairTravels.com where inspiring photos of the Red Chair can be seen from beaches to bandstands. Throughout 2013 and early 2014, photos and stories from the Red Chair’s journey to nearly 20 states from New England to California will be added to the website as they are captured. “Now it’s time for the chair to branch out,” expressed Colt. “Innkeepers across the country are clamoring to host the chair, so it’s time to send it coast-to-coast in every corner of America the Beautiful. There would be no Red Chair without the generosity of innkeepers and B&Bs. It’s a barn-raising of sorts; the sharing of a piece of Americana,” concluded Colt. Stories from the Red Chair’s travels have been chronicled on blogs at each stop throughout its journey. For a compilation of these blogs, visit redchairtravels.com/blog.html. For a complete view of Red Chair photos, visit redchairtravels.com and get ready to be inspired. To learn more about The Settlers Inn, the Inn who was graciously welcomed the Red Chair to the Pocono Mountains, visit thesettlersinn.com or call 570-226-2993. A beautifully restored arts & crafts lodge in the Lake Region of Pennsylvania’s Pocono Mountains. Artfully decorated with mission-style furniture and Arts & Crafts touches, this small Pennsylvania hotel welcomes you to an abundance of life’s quiet joys. The Inn's chef-owned restaurant has consistently maintained a commitment to fresh, locally sourced ingredients from regional farms and purveyors. Pocono Mountains visitor information is available online at PoconoMountains.com or by phone at 800-POCONOS (800-762-6667). Follow @PoconoTourism on Twitter to stay current with up-to-date information. Established in 1934, the Pocono Mountains Visitors Bureau is a private, non-profit, membership organization. The Pocono Mountains Visitors Bureau is the official destination marketing organization for the four counties of Carbon, Monroe, Pike and Wayne in northeastern Pennsylvania.